A few days ago I got a Flickrmail from the proprietor of a gift shop in one of our local malls. They were inquiring about purchasing several of my pictures. 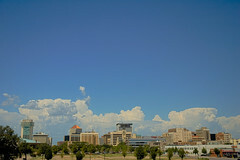 Today I got a check in the mail for Downtown Wichita and Keeper of the Plains. Very cool. They’re going to put them on mugs and magnets. Cool! That is pretty exciting! congratulation on the great work you do and love! That is great to get paid for something you do for fun! Congrats!